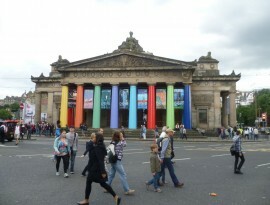 The Edinburgh Fringe is the world’s largest arts festival. It runs for 25 days and features over 50,000 performances between the 5th– 29th August 2016. There is no fringe committee, no vetting process or auditions meaning anyone can participate. Fancy it? The fringe is known for its unique and quirky venues, but this year The National Museum of Scotland will take part for the first time. It’ll show a mix of comedy, theatre and children’s activities. In 2015, Festival organisers sold more than 2.29 million tickets – but many shows were absolutely FREE! And this year is no exception; there’s 643 free shows and 164 pay-what-you-want shows included in the program. 1,731 performances in 2016 will be world premieres! Parking in Edinburgh city centre can be tricky at the best of times, never mind the busiest month of the year. So, if you’re thinking of travelling to Edinburgh for The Fringe, then why not park with PremAir? We have over 1200 spaces that can accommodate all types of vehicles and our location couldn’t be easier for city goers, especially if you’re travelling from the West.